Hello Wednesday Morning Studio Group. 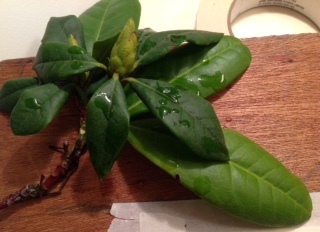 Here is the first lesson post for this site. Step one: find a subject and look at droplets, change the lighting, think about how to make them show up. Is the droplet darker or lighter or both depending on the angle? Which ones do you like the best? What do their shadows look like? How do they distort the object they are on? Remember, we are creating an illusion, so you get to choose how to do it. The aim is to get the impression of a droplet, not to actually copy one. 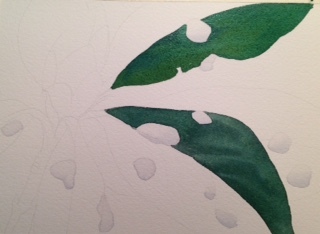 Step two and three: make a drawing of the subject and identify where you want to place the droplets. Then paint them as if they were 'pebbles'. (NOTE: you will be more successful in creating the illusion if you have more than one droplet.) Mix or use a grey that pleases you, then model the droplets by putting a thin layer of water down where you want the droplet to look light and then adding your grey where it is 'shadowed' and then blending gently with your brush. 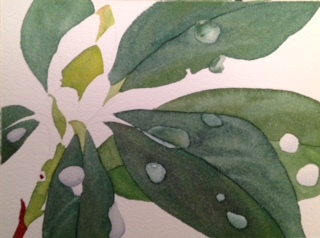 Step four: Begin to paint the leaves around the droplets. 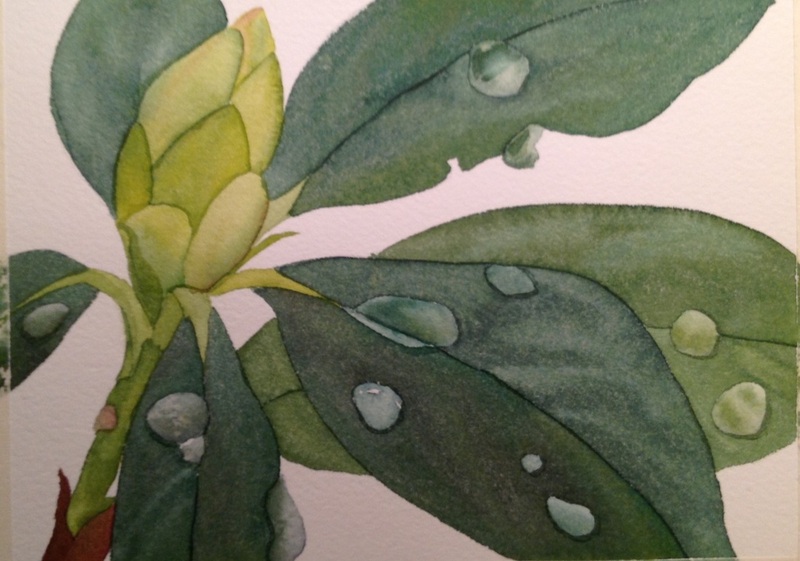 This will give you a gauge to paint the droplets (and will likely be where your inner critic is the loudest, I know mine was). 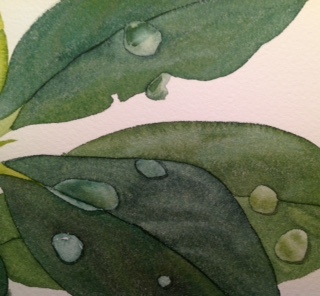 The droplets will be painted with the colour of the leaves after, or as you go. I tried to wait because of this being a demo, but you can see I was not successful in restraining myself. 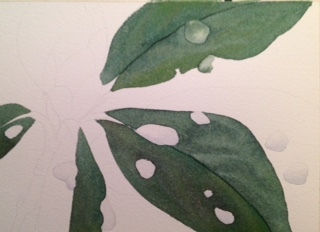 Step five: Adding shadows to your droplets can help them rise off the leaf a bit better. Note, not all the droplets are the same. This is fine. If you look at the photograph above, you will see that not all the droplets have the same light on them either. There is plenty of leeway here, the goal is to create an illusion.